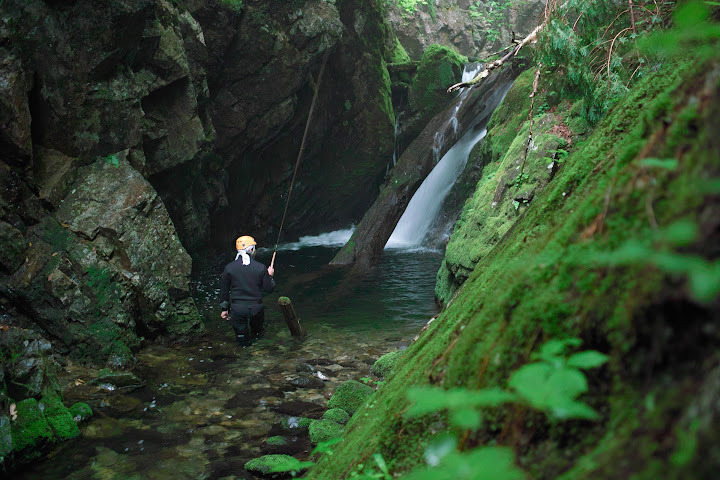 When I first started researching tenkara I ran into some Japanese blogs with some awesome pictures of people climbing waterfalls, swimming through pools, rappelling, and then enjoying some tenkara fishing in difficult to get places. 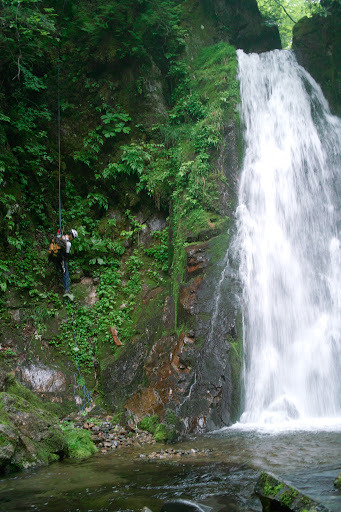 They called the activity of climbing waterfalls “shower climbing”, and in Japanese it is also called “sawa no bori“. 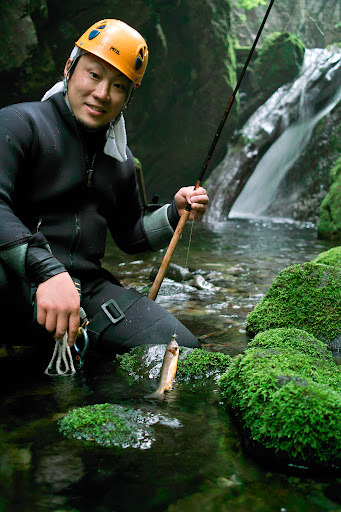 I’m a rock climber, backpacker, and fisher, so the idea of sawa no bori definitely appealed to me. It was one of the things I really wanted to do while in Japan but was starting to lose hope. Last month a scheduled trip had to be cancelled because of heavy rains. Now, a few days before I leave Japan, we had the trip scheduled, but it was raining hard a couple of day before. Alas, the weather cooperated; it was still raining, but not to the point we needed to cancel the trip. It was one of the coolest things I have ever done. I do hope to come back next year and do an overnight trip. There are several people I already talked about doing this trip with, so the chances are good there will be a repeat. On this trip, I was joined by Futamura-san, one of the staff of the Mazegawa Fishing Center, and Shintaro Kumazaki, a young guys who’s been helping with projects at the center. 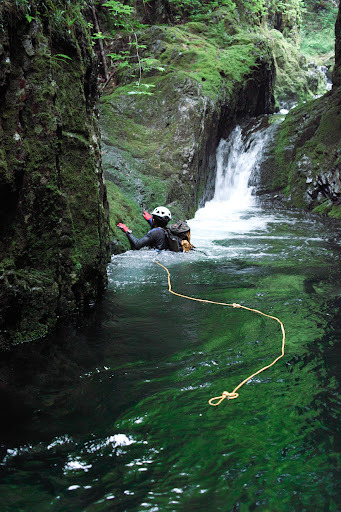 We descended a very small stream (with no fish in it), rappelled down a 45ft waterfall, and then worked our way upstream on a different gorge. For obvious reasons not many people visit the area, and so we were rewarded with many “Yamato Iwana”, a native Iwana (char family). 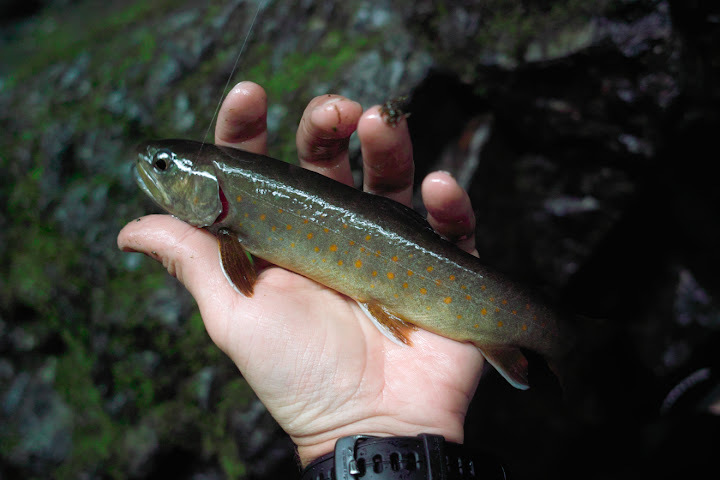 Unlike the Nikko Iwana, one of the fish that is raised in hatcheries and planted in most streams, which has white spots, the Yamato Iwana have beautiful orange spots on them and are completely wild. Towards the end I missed two large ones (about 15 inches or so) – the ones I’m still dreaming about. It was a very full day. We met at 7AM, started hiking around 8:30, and finished the expedition at 6PM after I free climbed a gnarly 75ft waterfall with no protection to setup a belay anchor on top. 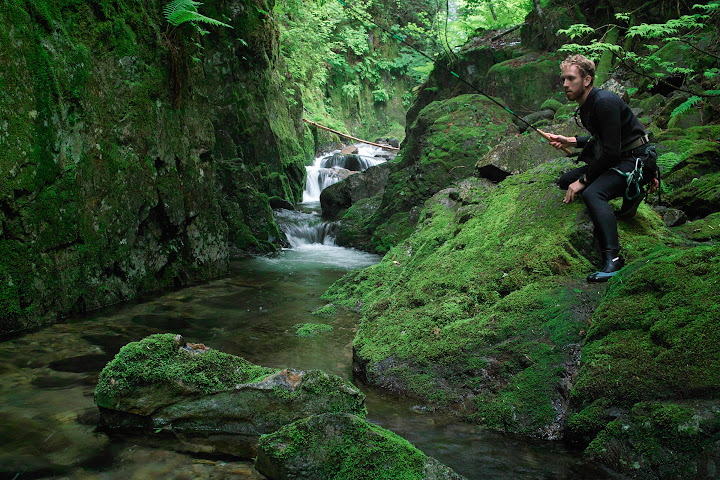 We did approximately 5km of climbing waterfalls and tenkara fishing. 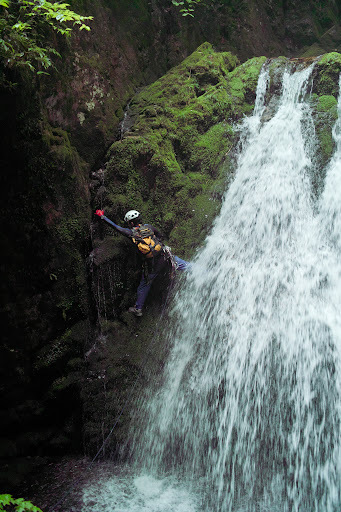 The picture below is one of the “easy” climbs, we all just free climbed it (maybe 5.5 rating, but with slick algae). Besides the last waterfall of the day (no pictures of that yet), the spot below may have been one of the sketchiest. We had to traverse relatively high, with a lot of moss on the rocks, and small edges to hang on to. 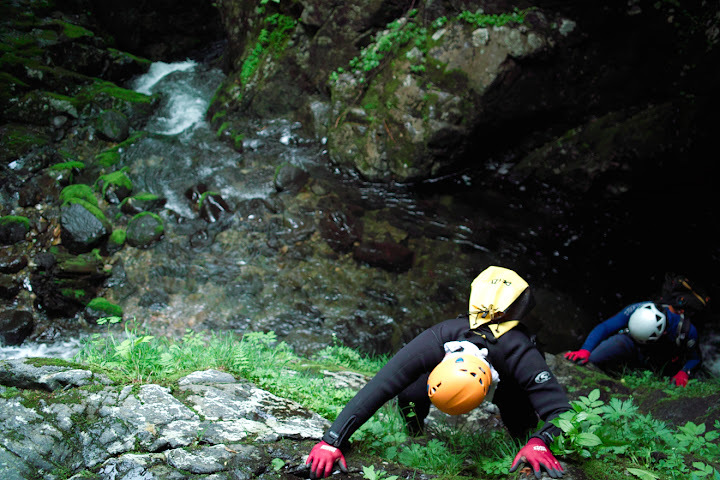 Another sketchy fall, Futamura-san climbed it with no protection to belay us from the top. Futamura-san is in his 50s and is the president of his local alpine club. He’s a very experienced climber and “shower climber”. This climb was my first “wet climb”, very gnarly. And, yes, we occasionally had to swim through very cold water too! It was interesting to have no alternative to plunging in the water, and especially fun seeing everyone hesitating for a moment before doing it. In case you’re wondering what I was using in such a tight stream, I used my 13ft Ayu, with a line about 9ft long and 3ft of tippet. What an adventure you’re having! I’ve always thought that wearing my Ebira Tenkara Quiver felt ninja-like. 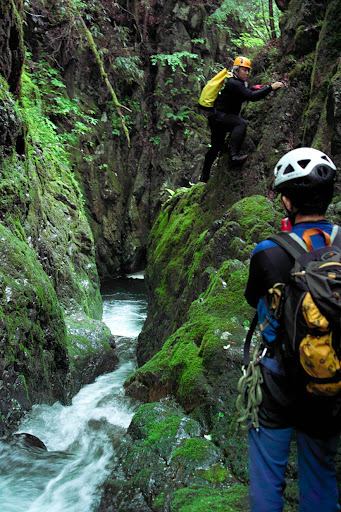 Climbing those cliffs looks pretty hairy – moss and algae are super slippery. It must make a ninja climbing the roofs of an ancient fortress seem tame. Yes, a bit hairy indeed. The moss was actually the nice part, it tended to be very thick and so was not (usually) slippery, but the parts where the rock was bare definitely were. There were a few funny moments when one of us would slip by walking around and just fall entirely in the water. At one point Futamura-san was setting an anchor at a pool above us, and he slipped in the water. After I climbed to where he was, I fell on the exact same spot. Not dangerous at all, but it was funny to be in the water so quickly.